During the summer I was sitting with a student of mine having a drink after class. For those of you who do not know me, let me reassure you that I have not in many years taught anyone who was not old enough to drink. We were sitting in a bar in Portland, Maine and after reviewing their brief list of scotch whiskeys I ordered an eighteen year old Macallan. He ordered a beer, and as we took our first sips he told me that he couldn’t justify paying $12 for a scotch when the $7 scotch was just as good. For the record this was a very reasonable bar. I told him that for my tastes they are nothing near the same. He said ‘Okay, so let’s say the more expensive scotch is 10% better than the cheaper scotch, does that really justify the expense?’ I asked if he had ever tried the ‘good stuff’ and he admitted that he had not. He did like scotch, and was happy to be proven wrong. I called the bartender over and explained our disagreement. 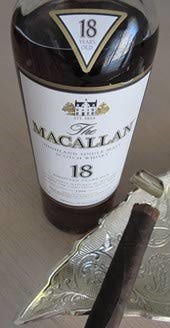 I asked her to pour him a glass of the eighteen year old Macallan, and asked if she would mind giving him just a sip of the twelve year old Glenfiddich (no slouch, but definitely the inferior of the two) to compare it to. He tasted the Glenfiddich, and then (after a sip of water) tasted the Macallan… and you could see in his eyes with that first sip that he knew I was right… the difference was definitely substantial! Of course, there was a time when I did not appreciate the difference either. When I was in the army I drank cheap scotch and smoked cheap cigars; my first car was a used Subaru Justy. The truth is that in life you get what you pay for. The day I took my first sip of single malt scotch was the day I stopped drinking blends. The day I smoked my first Cuban cigar (yes, my American friends, it is legal in Canada… although I smoked it in Israel where it was also legal) was the day I stopped smoking the crappy ones. As I have said many times I would rather have one good scotch than three mediocre ones, and I would rather have one good cigar than three crappy ones. For the record I drove that Subaru Justy for 9 months until it started falling apart, and didn’t trade too far up. There is a difference between relatively inexpensive consumables and transportation, and in the years after my release from the army I was in no financial shape to buy anything nicer. However I had driven better cars and looked forward to the day when I would be able to buy one… and I did. Quality costs money. You can buy an inexpensive suit and it will last a few months before the signs start to show, or you can buy a better suit that will last longer (I am told… I haven’t bought a lot of good suits in my life). You can buy a cheap suitcase and expect to replace it after a number of uses (been there, done that!) or you can buy high-end suitcases that will last. When my wife told me what she paid for my Briggs and Riley luggage I nearly fainted; five years and hundreds of flights later I swear by those suitcases, and have since bought several of the matching bits to complete the collection. It is no different when you buy a computer, or when you hire an IT Professional. You (more often than not) get what you pay for. Higher end systems last longer and work better, and higher end IT Professionals will save you money in the long run. Unfortunately when it comes to IT Pros sometimes you do not get what you paid for. I have heard horror stories from customers and community members about consultants who over-charge and under-deliver. That is why, just like when you choose a tailor, price should not be the only factor. You have to do your research… look them up on-line, ask people for recommendations, and when interviewing the IT Pro (yes, you can and should do that) you should ask for references. While a list of certifications is important, it means nothing without a list of prior satisfied customers. Let’s face it, people can cheat on exams… it is a lot harder to cheat on your clients. It sounds like I am perpetuating the cycle that you can’t get experience without a job and you can’t get a job without experience. That is absolutely not the case. Inexperienced IT Pros should spend some time working for more seasoned IT Pros who can show them the ropes, guide them, and have them work on projects which will give them experience. Of course this means that more often than not an IT Pro will not work for the same company for his entire career. That was the case before anyways, even though it may not have been explained as such. However as an IT Director it would be irresponsible of me to give a large architecting contract to an inexperienced IT Pro (IT Amateur?) who may have learned from books but has never been hands on. In the same way that I would never let a new tailor who just bought his first sewing machine to make my suits… although it would not bother me if that young tailor was assisting with or being supervised by a more seasoned tailor. While I am not a supporter of unions, I believe the electricians have it right. After school you take an apprenticeship, and that could have you sweeping floors on some days and doing work that some people today seem to feel is beneath them. It is how you pay the Master Electrician for whom you are working back for taking you under his (her) wing and teaching you. After the apprenticeship you get licensed, and soon enough (I do not know when or how) you too become a Master Electrician. I would love to see the same sort of system in place for IT Professionals, but I know that it is just a dream. However without that sort of system it is incumbent upon our new IT Pros to seek out the mentorship of experienced IT Pros, and it if some of those were to take on that responsibility I believe that we would have a profession worthy of the respect that I hope we are generally afforded. And now, as I close, I am going to put my laptop back into my Briggs and Riley laptop bag, and rest for the remainder of the flight which, I hope, is being flown by a very qualified and well-paid pilot. btw, I counsel my small business clients (who usually have no on-staff IT knowledge) that they should hire a top consultant just to validate the proposals of other IT contractors. Oh, and pay him a LOT, to save the client a lot by avoiding false steps.